Sequel to the 1964 film 'Black God, White Devil'. Sequel to the 1964 film 'Black God, White Devil'. Brazilian director Glauber Rocha's sequel to his 1964 film 'Black God, White Devil'. Mauricio do Valle reprises his role as outlaw warrior Antonio das Mortes, whose wandering life is given new direction when he lands a job as a jagunco (hired killer) for a powerful landowner in Jardim Das Piranhas. Doing what he does best, he soon tracks down and kills the remaining members of the local bandit gang - but realises too late that his battle should have been against the exploitative landowning classes rather than the dispossessed countryfolk. Brazilian director Glauber Rocha's sequel to his 1964 film 'Black God, White Devil'. 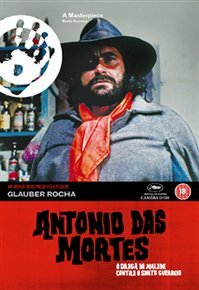 Mauricio do Valle reprises his role as outlaw warrior Antonio das Mortes, whose wandering life is given new direction when he lands a job as a jagunco (hired killer) for a powerful landowner in Jardim Das Piranhas. Doing what he does best, he soon tracks down and kills the remaining members of the local bandit gang - but realises too late that his battle should have been against the exploitative landowning classes rather than the dispossessed countryfolk.